Northstar Websites delivers custom designed Cross-Platform SmartPhone mobile applications tailored to meet your unique sales and marketing needs. Our primary focus for mobile app development is on cross-development. We specialize in translating a mobile app’s interface to all mobile platforms, including Apple’s iPad, iPhone mobile app, iPod touch, RIM’s Blackberry mobile app, Google’s Android mobile app OS, Palm Pre, Nokia’s Symbian, and Windows Phone. Northstar Websites focuses on next generation Android and iPhone apps and mobile website development by providing innovative solutions for your business. We’ve worked on a broad variety of mobile projects, from slick consumer to enterprise tools. Whether a simple promo tool intended to support brand awareness to more complex pieces of software catering to a specialized elite, we do it all. By creating custom-tailored smartphone software, businesses are now increasing sales and finding new ways to engage their customers. Since smartphone users are the quickest to get on board with new technologies, now is the time to consider expanding your business through mobile apps. Mobile software is built on the foundation of the mobile development industry – we know what it takes to get eyes on your brand! As your mobile partner, we work in tandem with your marketing staff and develop a detailed mobile strategy to ensure your app integrates with your company’s overall marketing objectives. 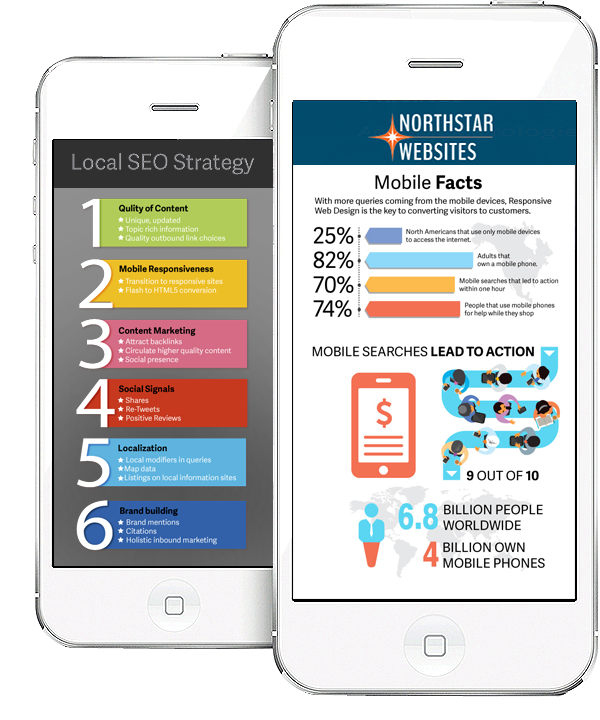 Using considerable resources, Northstar Websites finds and hires only the best design talent in the mobile niche. Our experienced designers can give your application a look and usability you’ll be proud of.